Due to “unforseen circumstances in his schedule,” Michael J. Fox will no longer be attending the Calgary Comic and Entertainment Expo. Organizers announced the news to fans via Twitter on Monday, citing Fox’s publicist. Fans who purchased a Michael J. Fox package, autograph, photo-op or a ticket to an Evening with the Cast of Back to the Future will be refunded. 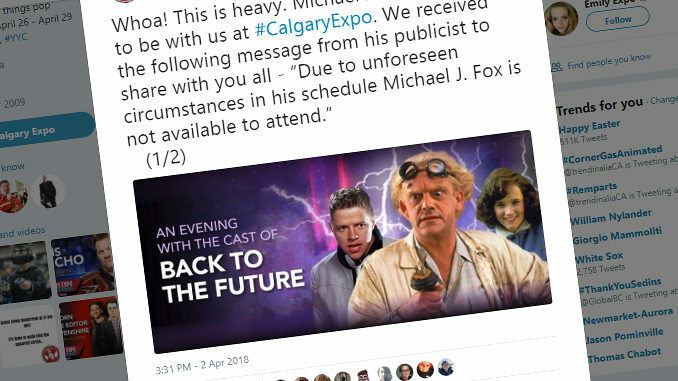 Christopher Lloyd, Lea Thompson, and Thomas F. Wilson are still scheduled to appear on the panel – however it will now be a complimentary event, included with the price of admission. The Expo runs from April 26 to 29 at Calgary’s Stampede Park. Born on June 9, 1961, in Edmonton, Fox starred in the Back to the Future trilogy, where he portrayed Marty McFly.